Do we look great or what. I have to tell you we were the hit of the Ugly Christmas Sweater Party. 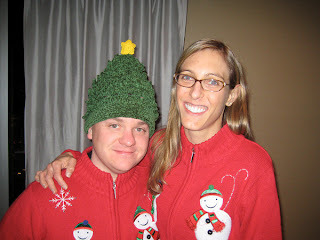 My wife and I are featured here in matching Snowman Sweaters from Sears. Do you love the hat? My mother in law bought it for me. I think she would have been proud to know how well it was received. Do you think we look "tacky christmas sweater party" enough? I only wish this was my pug. Dogs are notoriously full of holiday spirit. 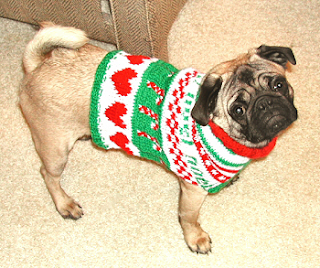 Just think how embarrassed you would be if you got beat out for best ugly christmas sweater by a dog! 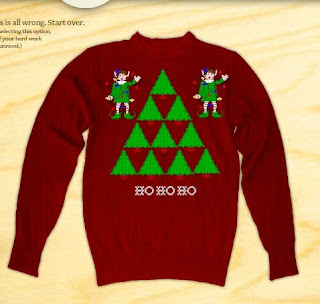 Awesome create your own Ugly Christmas Sweater site! These guys have really out done themselves. Basically it is an online configurator for Sweaters you could only dream of. <------Check out the masterpiece that I created. If only they could actually stitch it up and send it to you. Looking for that quintessential outfit for your Ugly Christmas Sweater Party? Well you have come to the right place. Just think you could look like these Ugly Christmas Sweater Party Allstars!!! Many people have laid claim to "inventing" the Ugly Christmas Sweater Party, but who really knows who started it first.